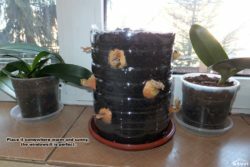 Here’s a super simple way of having fresh green onions all winter long without the need to invest in grow lights, heat mats, aquaponic systems, fertilizers or whatnot. There are chances that you already saw at least pictures of onion towers circulating on the internet, it was a real fad a few years back, but people usually don’t realize how easy and straightforward it is to make one, until they actually try. 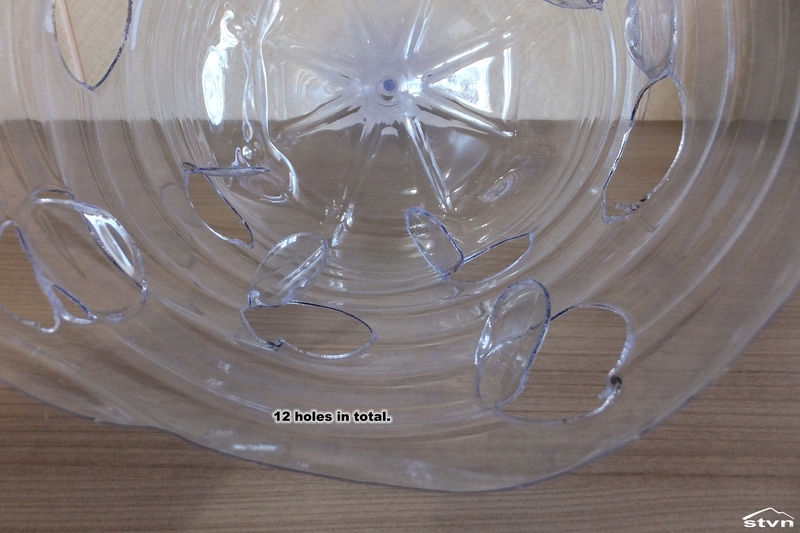 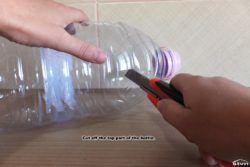 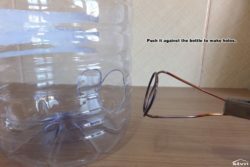 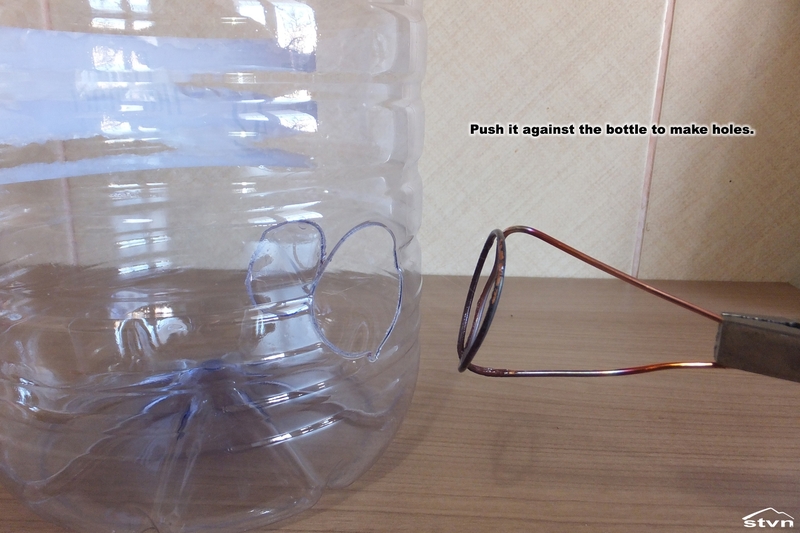 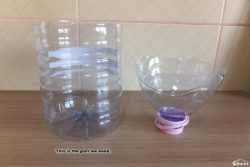 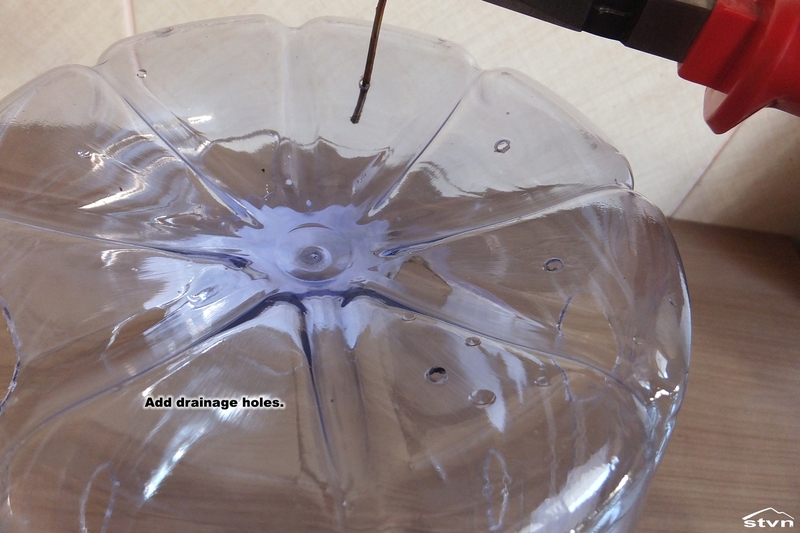 Start by cutting off the top of the water bottle, then make holes all around. 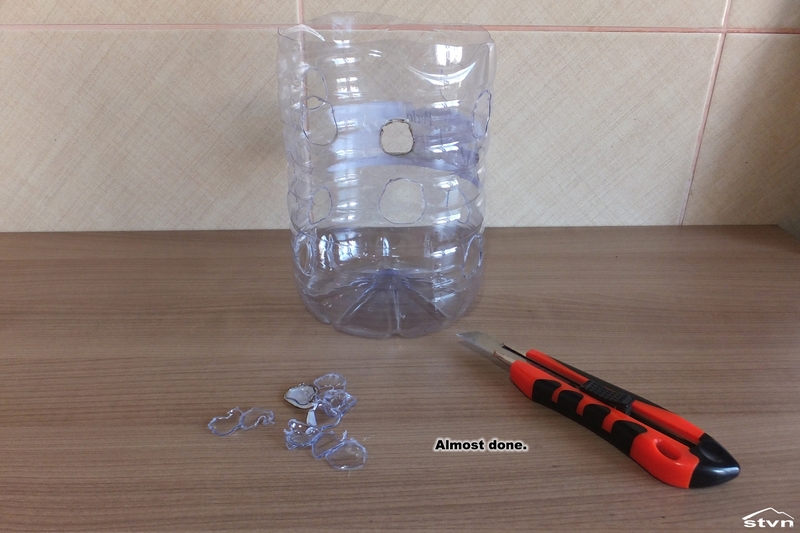 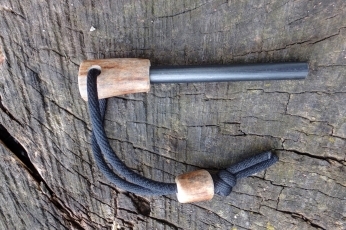 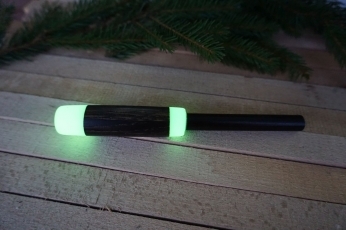 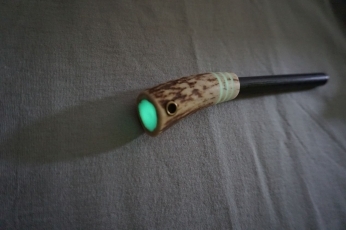 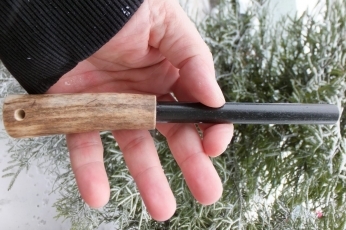 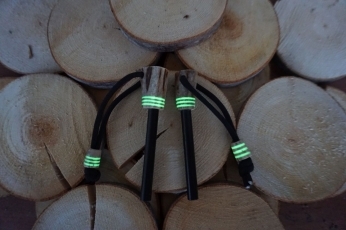 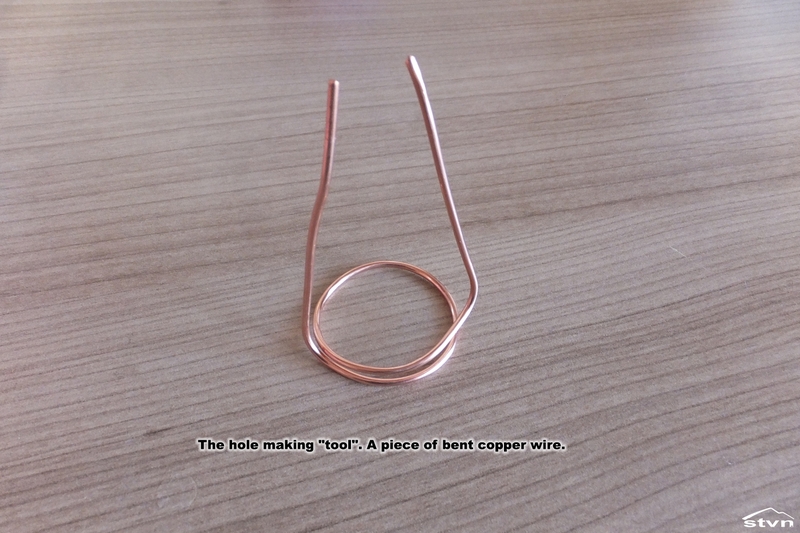 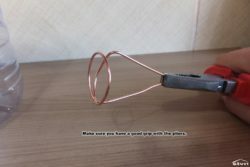 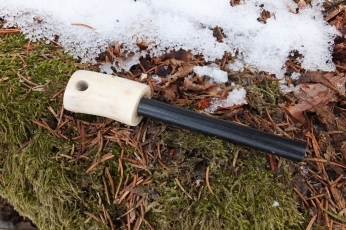 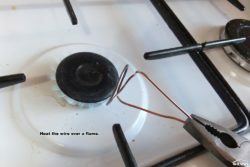 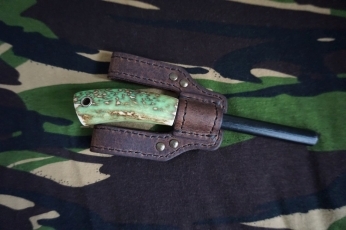 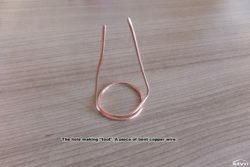 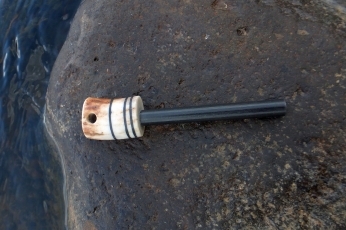 The holes should have the diameter of at least 4 cm (1.5 inches), I fashioned a wire circle and heated it to make the holes, but a knife or hole saw would also work. The container I used had a height of 20 cm (8 inches) and a circumference of 50 cm (20 inches), so I decided to go with 3 layers of onions and 4 onions per layer: 12 onions in total. Depending on your container and onion size you could make more or less holes, just keep in mind that bigger onions produce more and can be harvested over a longer period of time, I recommend fewer but bigger, versus more but smaller, onion bulbs. 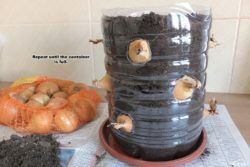 You should also make drainage holes on the bottom of the container for the excess water, or your onions might just rot and not produce. 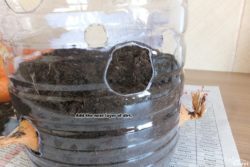 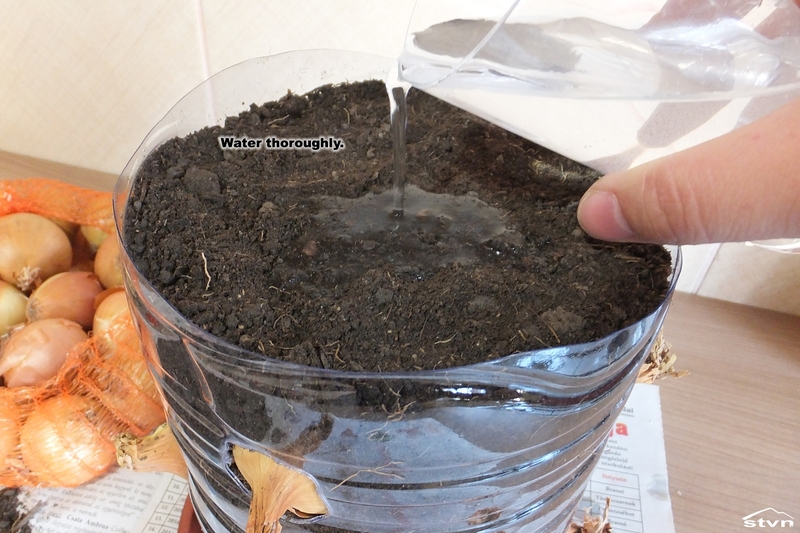 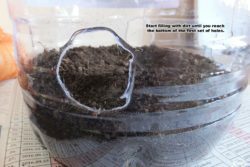 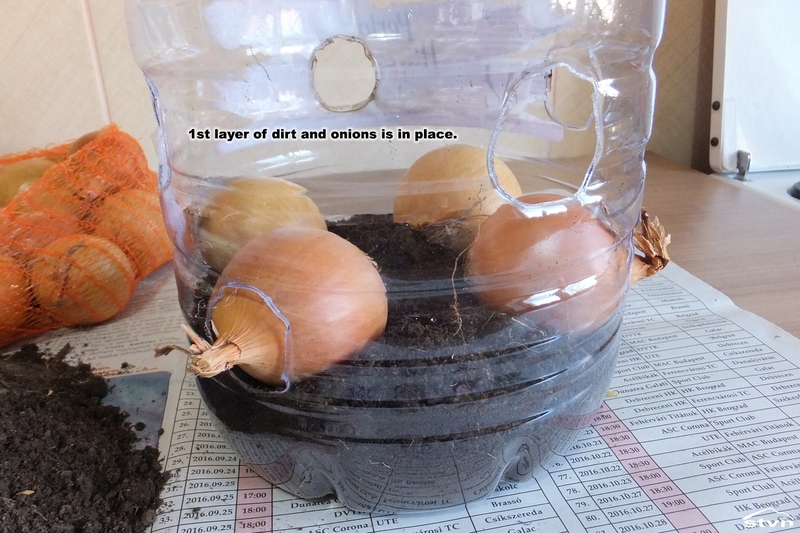 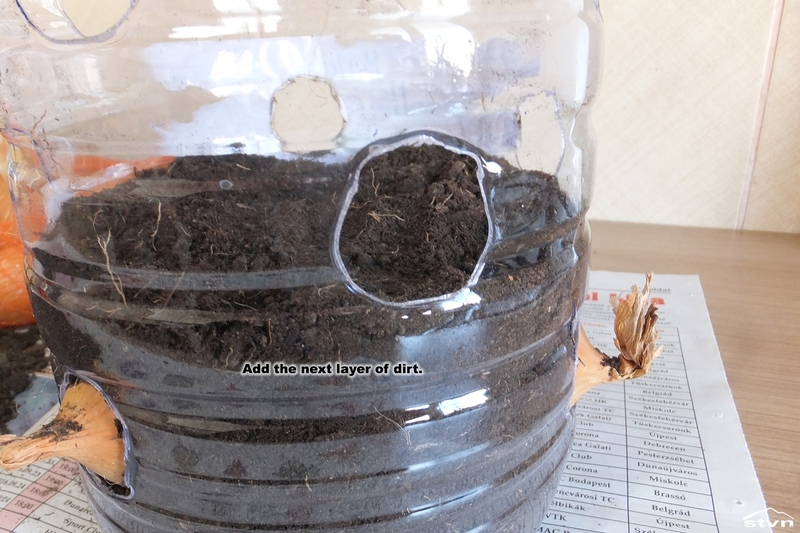 Once you got the holes made, start filling the bottle with dirt, fill until you reach the bottom of the first set of holes then place an onion bulb in each one. 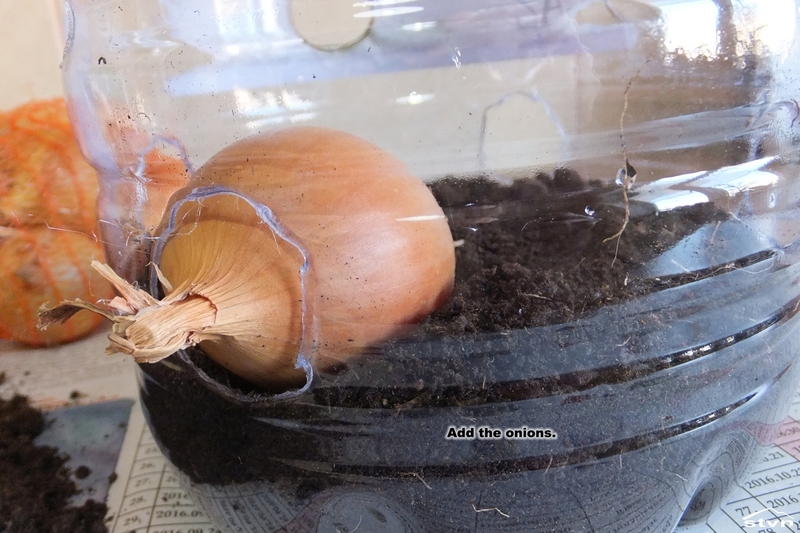 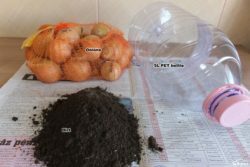 Just lay the onion flat on the soil, roots pointing inwards and leaves out, push it down a bit then gently push it against the hole as you fill around with more dirt, the onion bulb should block the hole as tight as possible so the soil doesn’t fall out. Repeat the steps above until your container is full, place it on a pot tray or saucer then water thoroughly. Yes, you need to wait and occasionally water the onion tower, but only if the top 2 – 3 cm (1 inch) of the soil dries out. 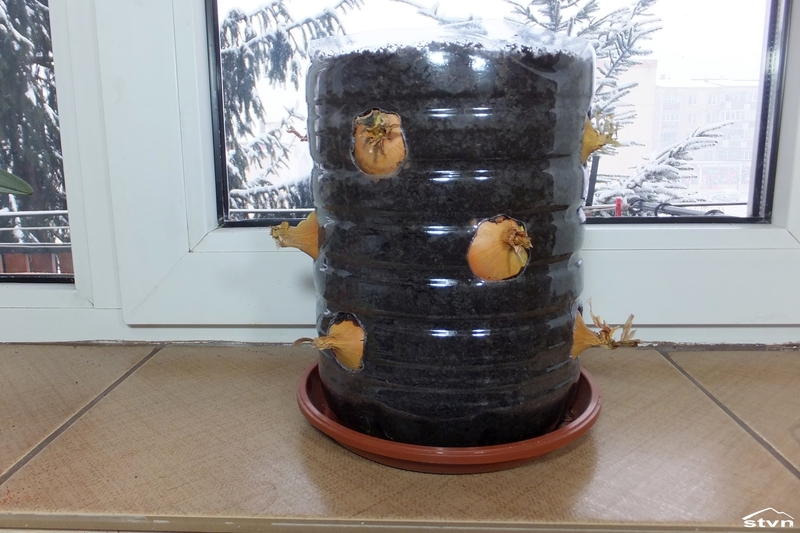 How long you will have to wait mostly depends on temperature, if you keep the onion tower inside, at an average room temperature of 18 – 20 C° (64 -68 F°) it takes about 14 days until it starts to sprout, if it’s colder it takes longer. 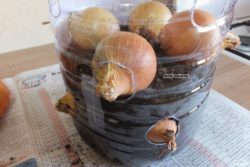 Here’s a quick story: in the previous years I bought the onion bulbs I planted from the local farmers’ market, but this year I got lazy and bought them from a supermarket; in the previous years, as I said, it took about 14 days for the onions to sprout, but this year it took them almost 40 days under the same conditions. It might be coincidence or it might be an anti-sprouting agent, who knows, too bad I don’t believe in coincidences. Once the onions start sprouting there’s no stopping them, you will eat green onions for breakfast, lunch and dinner. And the best part is that no mater how often you cut the sprouts back they’ll just keep on regrowing for months. 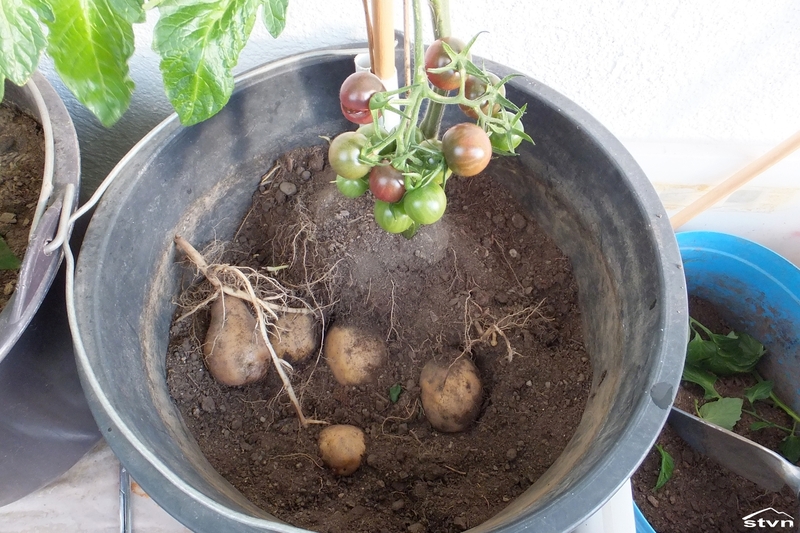 Thanks for reading and bon appétit! 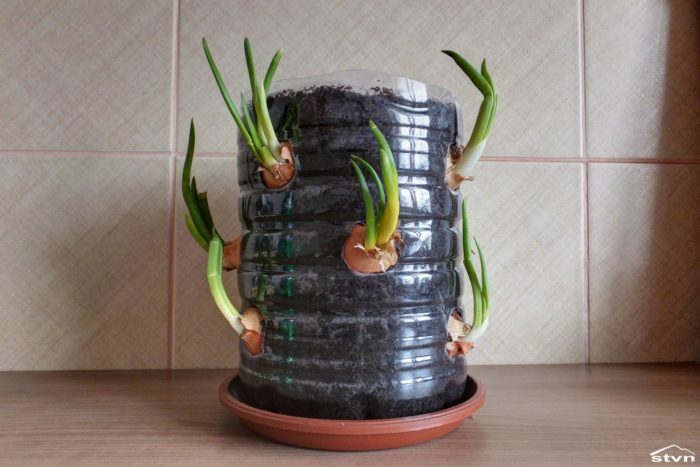 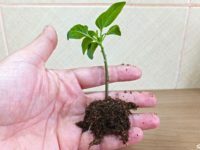 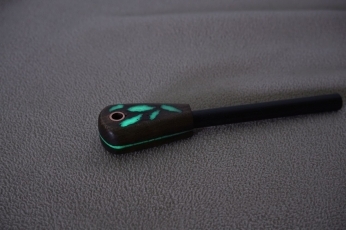 You may copy this article as long as you link back to this page (https://stvn.eu/green-onion-tower/) or the frontpage (https://stvn.eu).